IDs, Drivers' licenses, Registration Cards, Smart Cards . . . 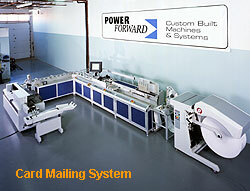 The PowerForward Card Issuing System is designed to meet the needs of high volume card issuers. It automates all functions between card manufacture and mailing. This mass issuance system processes millions of flat cards a year - all types (except embossed financial cards) including: gift cards, loyalty cards, membership cards, ID cards, drivers licenses, social security cards or health cards. Integrated multi-function card system for processing flat plastic cards . 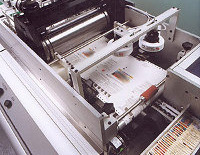 . . from feeding and reading cards (in any order) through sealing and metering envelopes. The personalization and mailing features of the system can also be used (without cards) to mail correspondence, statements or other documents to customers. The system is designed for card issuers who have decided to manufacture their cards as a separate initial step. And then prepare them for mailing (or shipping) in a second higher speed operation. The throughput of the system is controlled by the mailing machine with the goal of keeping the whole integrated system running at full speed without stoppages or gaps, even when problems occur in assembling the input for mailing. Several verification steps ensure that only good cards are mailed. View or download our Card System Information Sheet.